The growth of the Jewish population in what was known around 1900’s as the “New West” districts of Berlin, chiefly in the affluent district of Charlottenburg, from less than 5,000 inhabitants in 1885 to over 23,000 by 1910, brought about the need to erect a large synagogue. The land for the new synagogue was purchased in October 1905 for 600,000 Marks. Located at 79-80 Fasananenstrasse, between the fashionable Kurfurstendamm Avenue and the then newly extended rapid transit city train (S-bahn), the Fasanenstrasse synagogue was the first monumental Jewish prayer house to be opened outside the city center of Berlin. The cost of construction came to a total of 1,100,000 gold Marks, an enormous amount of money at the time. The plans of the synagogue were drawn by the architect Ehrenfried Hessel who was selected by the Jewish community in a public competition in 1907. The construction work started two years later and continued for another three. The official opening of the new synagogue took place on August 26, 1912. 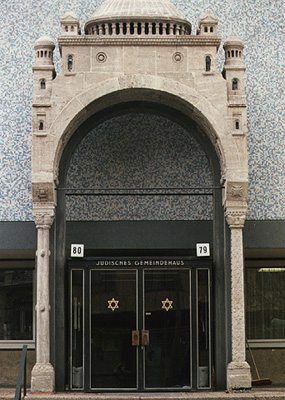 The architecture of the Fasanenestrasse synagogue is representative of the prevalent ethos of the Jews of Germany at the turn of the 20th century. The introduction of a design inspired from German medieval architectural tradition was intended to emphasize the new status and the supposedly successful integration of the Jews into the German society. The strong nationalist currents that emerged in Germany in the years following the achievement of its political unity and the economic impetus that by 1900 turned Germany into the most powerful nation in Europe could not have marked large sections of the Jewish community. Many Jews took pride in being Germans and their desire to show their integration into the German society repeatedly found expression in the architecture designs of a large number of monumental synagogues built all over Germany after the middle years of the 19th century. With their imposing exteriors, the new synagogues boasted a local and nationalistic style that many times incorporated elements from the tradition of the German medieval architecture. The monumental building of the Fasanenstrasse synagogue was designed in a predominantly Romanesque style to which were integrated some elements of Byzantine inspiration, most notably the roof that featured a row of three cupolas. It was a massive structure with a total capacity of 1,700 seats. At the opening time the new synagogue was praised by both professional architects and the Berlin popular press. 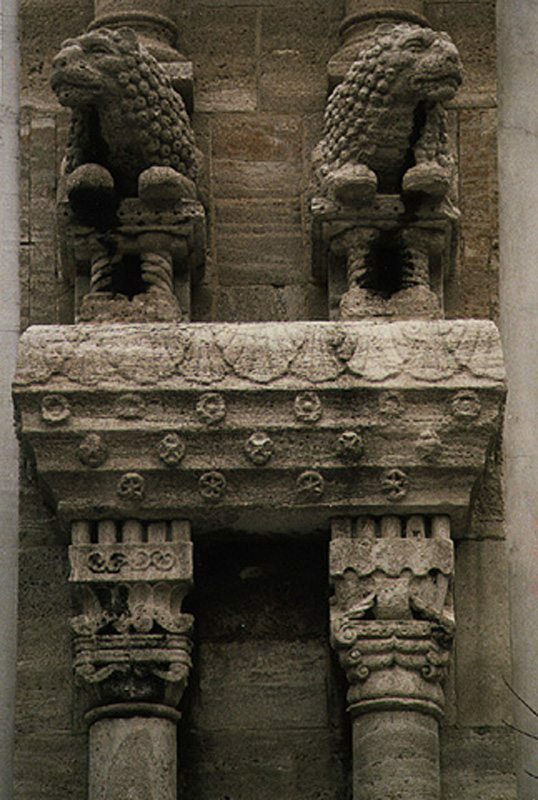 The western façade had three stone portals; the central one was decorated with columns on top of which there were statues of lions and other decorative elements. In the interior a spacious room preceded the main prayer hall. The east end of the prayer hall ended with an apse sheltering the Holy Ark. In front of it stood an elevated bimah crowned by a medieval style portal that could be accessed from two symmetric stairs. Large menorahs lighted this section of the building. The east end gallery was located at both sides over the Holy Ark and had 35 places reserved for the choir. The organ, too, was located at the east end of the prayer hall. The women’s section occupied the additional galleries built around the other three walls of the prayer hall. Solid pillars sustained the three large cupolas. The cupolas, the interior walls, and the capitals were decorated with geometric motifs in a dominantly blue and gold pallet. A separate smaller building adjacent to the north wall of the synagogue served as a prayer house; it also sheltered residential rooms for the clerks of the synagogue. The basement contained a large hall that was used mainly for weddings and other private or community ceremonies. The Fasanenstrasse synagogue functioned for only twenty four years. It served the liberal Jewish community of the western districts of Berlin. 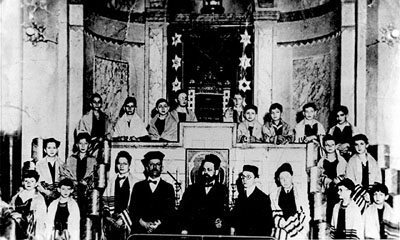 Rabbi Leo Baeck (1873-1956), leader of the progressive Judaism, officiated at the Fasanenstrasse synagogue after settling in Berlin in 1912, Magnus Davidsohn was the main cantor for many years, and Richard Altmann, who was blind, was the organist. The ascent to power of the Nazis in 1933 changed drastically the status of the Jews in Germany. The Nazi persecutions and the ensuing massive emigration of the Jewish inhabitants of the neighborhood brought led to the closure of the synagogue in 1936. Two years later the Fasanenstrasse synagogue was burned in the state sponsored anti-Jewish attacks of November 9th, 1938, also known as the Kristallnacht. Total destruction followed a few years later during World War II, when the remains of the synagogue were destroyed during an Allied air raid on Berlin. After the Holocaust only a handful of Jews returned to Berlin, most of them immigrants from Eastern Europe. During the late 1940’s they started organizing a new Jewish community in the city. The grounds of the former Fasanenstrasse synagogue were chosen for the building of a new Community Center of Berlin. The corner stone of the new building was laid in a ceremony attended by the Mayor of Berlin, Willy Brandt (1913-1992), in 1957. The construction work started in 1958 with the evacuation of the ruins of the former structure, of which a few surviving elements were kept for the decoration of the new building. The building of the Jewish Community Center in Berlin was inaugurated on September 27, 1959. Erected in the modern style of the 1950’s, the Community Center building was designed by the architects Knoblauch and Heisse of Essen. Although essentially a modern structure with predominantly geometric straight lines, the new edifice displays decorative elements from the building of the former synagogue, most notably the main portal that survived and was incorporated as the entrance to the modern building, and three glass cupolas as a reminder of the most impressive architectural element of the former synagogue. Additional Jewish decorative elements are evident on the back façade which is decorated with a pattern of six pointed stars (Magen David). The Jewish Community Center on Fasanenstrasse houses a number of important cultural and educational activities, such as lectures, concerts and workshops, and is the home of the Jewish Community Library. A memorial wall at the right side of the entrance displays the names of the Nazi concentration camps and ghettoes to which about 58,000 Jews of Berlin were deported during the Holocaust, of them the great majority never returned. A separate plaque commemorates Recha Freier (1892-1984), the founder of the Youth Aliyah Movement. In the late 1980’s a monument in the form of a Torah scroll was inaugurated in the forecourt of the Community Center featuring the Biblical quotation: “There shall be one law for you and the stranger among you” (Numbers, 15:16).